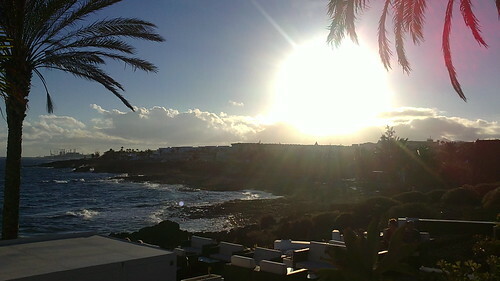 I arrived in Costa Teguise at around 8am this morning, to start training for a job in a hotel. It was good because I had kindly been given a lift there, so didn't have to spend money on the bus. The only problem: I wasn't due to begin training until 9:15am. This could have been quite annoying as almost everything was closed, and all was quiet in the town. 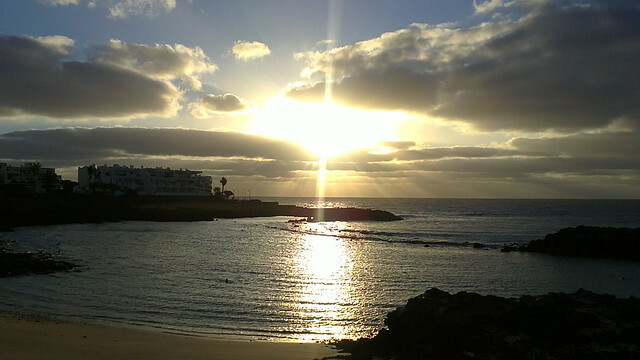 As usual though, the weather in Lanzarote didn't let me down, and I was in time to see a spectacular sunrise by the beach. The sea was calm, there was barely any wind, and it was very tranquil walking along the sea front. It is mid October, but even at that time the temperature was perfect and there were people, as joggers passing me by, and others even swimming. After reading that snow is soon to descend on the UK, with a severe winter due, I know where I would rather be, especially with views like this! 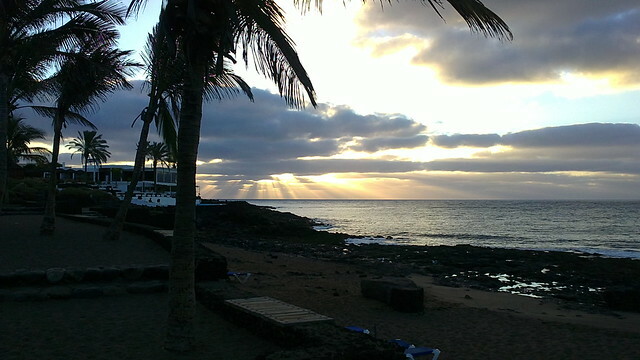 Have you ever been to Lanzarote? Where would you recommend to go on the island? Any suggestions would be great as I'm still exploring! Most of you who have your own blog and enjoy writing on it would probably agree with me when I pose the question what is the point if no-one is reading. Of course some people write just for the fun of it, and it is good to be creative, but it's also nice to know that people find what you are writing interesting. The more people who know about your blog, the more chance there is that they will tell their friends and so on and so forth. If you are proud of what you have written then letting other people know about it is always a must. What are the best ways to go about gaining readership though? If you want your blog readership to grow significantly you should definitely share it across social media sites, especially the big five: Facebook, Google Plus, Twitter, LinkedIn and Pinterest. Do not bombard your readers with posts though as this will just annoy them. Try to be selective with your posts, and ask questions to try to spark a conversation. People love to voice opinions and if they are given this medium on your blog then they will be more likely to come back again. There are some great sites out there for gaining readership for your blog apart from the social media sites. One of these sites is called Bloglovin. 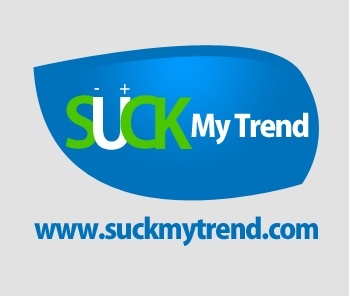 It allows you to follow as many blogs as you want directly from the site and gives the ability to like and share posts It is a big advantage for your blog if you put it on there as there are millions of other users. I've been away for a while, from both my blog, and the UK. It's been six weeks since I left rainy England to experience a year of life here in sunny Lanzarote, and a while longer since I wrote anything here. 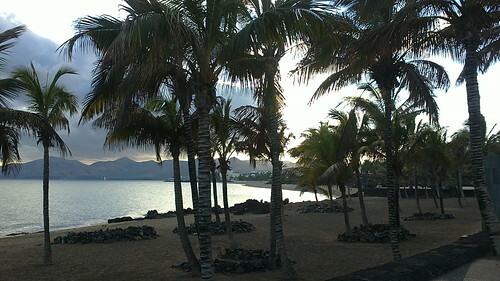 Well I'm happy to announce I'm back to my blog, and even more happily, staying here in Lanzarote. For those of you who don't know, Lanzarote is one of a chain of seven Spanish owned islands called The Canary Islands, located off the North-West coast of Africa. It may seem strange that they are owned by Spain considering how far they are away from there and how close they are to Africa, but just remember all the overseas territories the UK owns. The UK even controls the Southern most tip of Spain: Gibraltar! Lanzarote and the other islands in this chain were created by volcanoes long ago, but their volcanic history can still be seen here in the present. Well I digress, so back to telling you all about what is like to live in Lanzarote. First of all the weather here is amazing. Yes I know, that is a very British thing of me to mention, but who doesn't love it when the sun is shining and you can stroll around in shorts and t-shirt? That's not just during the day either, as so far since I've been here it remains warm well into the night. It is approaching mid-October and temperatures during the day are still perfect for sunbathing and swimming at the beach. 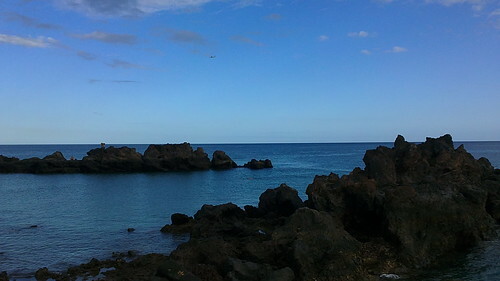 Which brings me nicely onto another a major plus point about Lanzarote: the beaches. This amazing island boasts a huge number of spectacular beaches all around its coastline. From the tourist hot-spots of beaches at Puerto del Carmen and Costa Teguise, to more remote beaches such as that of Famara with its stunning cliff backdrop. There are beaches suitable for all tastes and interests; there are beaches for sunbathing and strolls, snorkeling scuba diving, and any other beach related activity you could think of, from surfing to paddle-boarding. This really is a perfect place for outdoor life and keeping fit. I have been assured that the weather rarely gets cold and so far it has hardly rained at all. It almost seems a shame to be inside writing, but then again variety is the spice of life. As Lanzarote depends heavily on tourism, you will not be disappointed if you are visiting the island for that much deserved break from the working life. There is an abundance of shops, restaurants, cafes, bars and clubs. Although prices do vary depending on where you are visiting, I have not so far noticed anywhere that rips off tourists. In fact prices are generally much cheaper than back home in the UK. Yesterday I went out for a meal with my girlfriend at a nice traditional Spanish restaurant in Costa Teguise, and had three courses for 10 euros. A typical price for a cappuccino or latte in cafes around the island is around 1.5 euros. You can eat a full English breakfast at many cafes in Puerto del Carmen, the main tourist town of Lanzarote for 2 euros! While the predominant language of the island is Spanish, as you would expect being owned by Spain, you can definitely get by with just English. Most places cater for Spanish, English and German speakers as these are the main groups of tourists, but there are tourists from many other places such as Italy and France. It is this diverse mix on the island that makes it interesting. You can bump into people from all over the world, on this tiny Spanish island off the coast of Africa. Now that I have settled into life here I hope to be able to write here more regularly on my experiences of life in Lanzarote. This has just been the story so far, I will keep you posted with the rest. Hi Simon, wanna go surfing? WANNA CATCH A FEW WAVES? WIN A TRIP TO PARADISE! The premise was simple - in order to win a once-in-a-lifetime adventure to the Maldives with your best friend all you had to do was tweet #GONESURFING #HILFIGERCLUB with your favourite surf spot or surf tale. Despite the fact that I had never actually surfed before in my life, I didn't want to let that stand in my way of such an amazing prize. 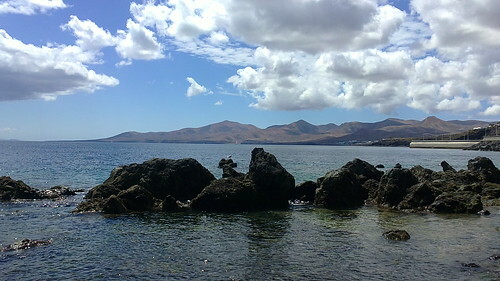 I knew just the place to Tweet about - Famara beach in Lanzarote which I had been to last August when on holiday there. 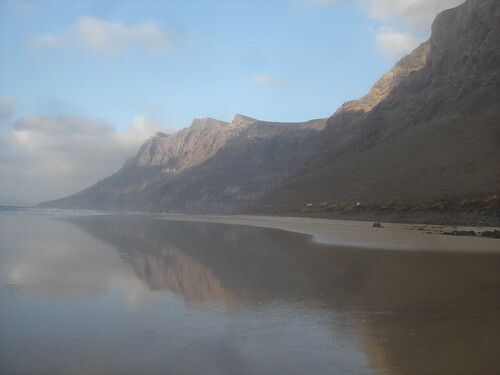 "Famara, #Lanzarote is a great place for surfing with its epic cliff backdrop! 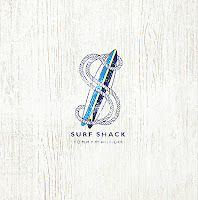 See here- http://pinterest.com/pin/466192998897386294/ … #GONESURFING #HILFIGERCLUB". I didn't really expect anything to come from it but I had nothing to lose. About a week later I missed an early phone call but later on in the day I received an email from a Tommy Hilfiger employee saying I had been shortlisted to win the trip! It was all very sudden as the trip was due to take place a month later from the 14th – 22nd of June 2013. After some setbacks in terms of who I was taking in which I had to change my guest joining me to my dad, I was told I had won the trip! Two weeks later my dad and I flew to Lisbon Portugal to begin our amazing #GoneSurfing trip. We were met at the airport and taken to an amazing hotel in lovely town called Cascais, where we were to stay for a night and have a surfing lesson. We were joined by an amazing international group which included 1 English, 2 Belgians, 4 Spanish, 2 Dutch, 1 Italian and 1 Australian. A couple of hours after our arrival we headed straight to the beach for our surf lesson, the first of mine and my dad's life. Surf lesson in Cascais, Portugal. Cascais is a very beautiful town and the hotel we stayed at was amazing, as you would expect from a 5 star hotel called the "Grande Real Villa Italia Hotel and Spa". It was probably the best hotel I have ever stayed in, and was extremely luxurious. The staff were extremely courteous and everything was decorated and maintained to a fantastic standard. Our stay in Portugal was short but sweet; the next day we left for the airport in the afternoon for a flight to Dubai airport on route to Male in the Maldives. Both flights were with Emirates airlines which again was an excellent experience with top quality service, tasty food and modern services on board such as touch screen TV screens. Tommy Hilfiger it seems spared no expense for this whole holiday, and it really was living up to the billing of "Trip of a lifetime". When we arrived at Male airport we couldn't believe it as it was raining heavily. We had travelled away from the UK to escape the rain. Luckily though this was just a passing shower which only lasted a couple of hours and was pretty much the only rain of the whole trip. We met a Portuguese guy who was to be our surf instructor in the Maldives and an Australian lady who came to photograph the trip alongside her friend Sonny the trip photographer. The Maldives really are a different world and like nothing in Europe. My dad and I on the Princess Ushwa, the boat we all stayed on for a week. The Maldivian crew of The Princess Ushwa were second to none. They were extremely polite and friendly and mostly spoke a high standard of English. The boat was spacious, clean and comfortable and we were provided with big meals for breakfast, lunch and dinner. I have not been used to eating that much sea-food before but it was delicious none the less. We needed the big meals to keep us going on all of our trips out swimming, surfing and snorkeling. My dad and I both realized early on in the trip that we are both out of shape. My dad being 55 has much more of an excuse though. Theoretically I am in the prime of my life but I really didn't feel like it trying to paddle against waves and after swallowing too much sea water. I felt rather sea-sick at some points on the smaller boat that transported us out to the waves. I couldn't stop myself from throwing up over the side of the boat at one point but luckily the others didn't see. #GoneSurfing group shot next to a ship-wreck. During the middle of our Maldives adventure we went to an absolutely stunning resort to relax in their infinity pool, enjoy complimentary cocktails, go snorkeling, feed stingrays and soak up the luxurious ambiance. Although we didn't get to stay there it was a real privilege getting to see this amazing island retreat. To top off a fantastic week in paradise, we were taken to a deserted island for a beach bonfire party with music, beer, barbecue and games. It was really good fun and ended the holiday on a high. Amazing sunset on our final night in the Maldives. Overall this was an absolutely amazing experience that I will never forget. For anyone that ever doubts whether or not to bother entering these competitions, you've got nothing to lose and possibly everything to gain so next time you see something on Twitter give it a go. 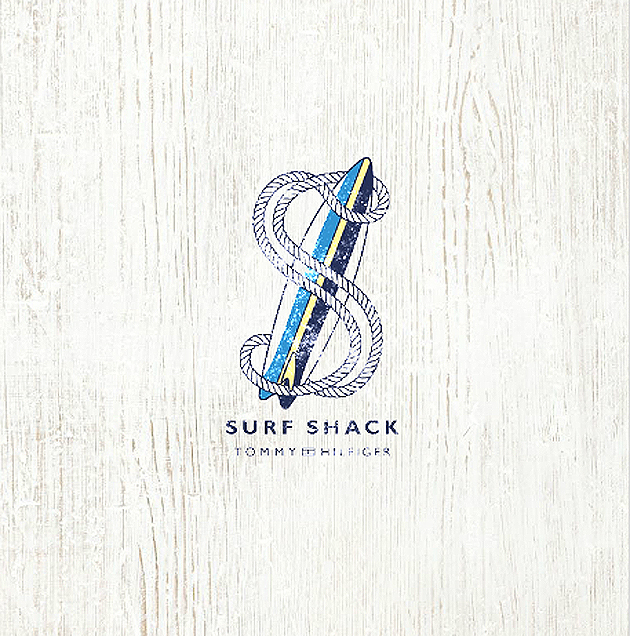 I haven't returned a pro-surfer but I am extremely grateful to have won this once in a lifetime trip courtesy of Tommy Hilfiger. Thanks Tommy! This is a Flickr badge showing items in a set called Portugal -> Maldives - Tommy Hilfiger #gonesurfing Tour. Make your own badge here.